An outdoor pool free coffee and low rates make Motel 6 South Lake Tahoe a budget-wise choice for our guests. This two-story exterior corridor hotel has 140 rooms that come with free local calls Wi-Fi (for an additional fee) and cable TV with HBO. Non-smoking rooms may be requested. Free coffee is served in the lobby each morning and a seasonal outdoor pool is on-site for recreation and relaxation. The hotel provides a 24-hour front desk guest laundromat and free parking. Pets are welcome for an extra fee. Located three miles from downtown South Lake Tahoe on Highway 50 the hotel is also three miles from Heavenly Mountain Ski Resort. Thomas F. Regan Memorial City Beach is two miles away. For indoor recreation Caesar's Palace Tahoe and the Lakeside Inn & Casino are within five miles. Magic Carpet Golf is a three-minute walk from the hotel and Bijou Municipal Golf Course is less than three miles away. 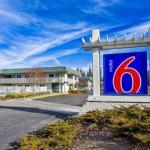 Motel 6 is two miles from Lake Tahoe Airport and 55 miles south of Reno-Tahoe International Airport.